I really enjoy Mark Boone Junior and I feel magnetically drawn to him every time he’s on the screen. Nicotera isn’t bad either. Drew isn’t exactly a sympathetic character, but you can understand where he’s coming from. Larry is just plain sinister. June is harder to crack: both strong and fragile at the same time. Quartin and Nicotera volley off each other quite nicely. And then there’s Marilyn Manson playing an enigmatic hermit hit man. You have to hand it to him, nobody creeps and lurks and skulks quite like him. His performance is restrained, his stillness and silence somehow more menacing than outright aggression could ever be. He’s an unknown quantity, used sparingly by the script, so you always feel off-kilter when he’s around. The story turns out to be a little more complex than you first think, the script hiding some family secrets to be unearthed along the way. The patient shall be rewarded. Let Me Make You A Martyr unspools itself slowly, but there’s a spartan method to it that you come to appreciate. This entry was posted in Movie Reviews and tagged Fantasia Film Festival, Marilyn Manson, Mark Boone Jr., Niko Nicotera, Sam Quartin on August 13, 2016 by Jay. 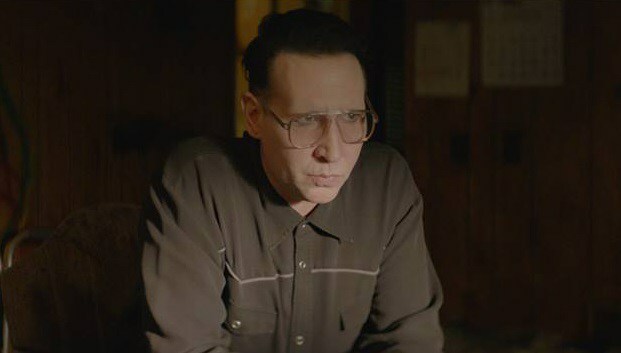 Marilyn Manson is an actor now ? Has been for years. Appeared on Sons of Anarchy along with several other members of this cast. Wow. Now that sounds sick enough for Tubularsock. And Tubularsock can “sing” along with MM! It’s just so odd to see Manson as a celebrity…I remember when he played this show at a club in Florida, and we (young goth snots that we were) lumped him with all the other wanna-be and overly dramatic indie/local goth musicians prancing around during that era. And then he pranced right out of there. WEll you’re right, that’s one good way. Well she is just his adopted sister so they are not related by blood…in the soap opera world that plot is old hat:) Killing daddy dear seems to be the thing to do and I can see Manson actually being pretty good as an actor.